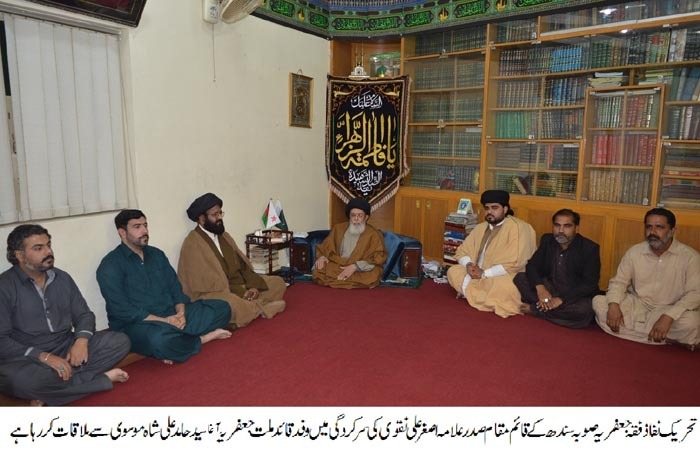 ISLAMABAD, March 26: The Patron-in-Chief of the Supreme Shia Ulema Board and chief of the Tehreek Nafaz Fiqh-e-Jafariya Agha Syed Hamid Ali Shah Moosavi has advised the rulers not to misunderstand the good wishes extended by Modi on the Pakistan Day as the ‘Ram Ram’ reciters keep atomic bomb under their arm. The agenda of Chankiyee followers who boast of breaking Pakistan is to destruct Pakistan. The word of Modi who is all out to deprive Pakistan of water is not dependable. Had the Muslims not become colonial agents and had they taken steps to protect the Islamic World instead of saving their own rules then the Muslim Ummah would not have to see these black days. Muslim rulers should resolve the regional issues like Golan Heights, Kashmir and Palestine considering these as Islamic issues. A consensus line of action should be adopted by summoning the OIC Summit by the Muslim rulers. The steps taken by the New Zealand Prime Minister have won the hearts of peace-loving friends all over the world. These views were expressed by him while addressing a delegation that called on him at the head of Acting President TNFJ Sindh Allama Asghar Ali Naqvi. Agha Moosavi said when a new geographical boundary was brought forward by staging coup against the Khalifate of Usmania, the objective of nefarious design was to divide Muslims and stabbing the knife of illegal Israeli State in their back. The British colonial power was the creator of this Zionist state while today America is protecting it. He said soon after coming to power, Trump speedily worked on the Zionist agenda, Islam was attached with terrorism, restrictions from entering America were imposed on more than half a dozen Islamic States, Iran was declared hub of terrorism at the forum in which 39-state alliance was formed where Trump was invited as a special guest and international laws were torn apart openly by recognising Bait Al-Maqdas as capital of Israel. On this situation, the whole Islamic World would have become the symbol of protest and would have adopted a consensus point of view against it but the Islamic World kept its silence over it as a result of which America has also recognized Israeli occupation on controversial Golan Heights. The TNFJ chief said the satanic Modi-Netanyahu-Trump trio is pushing the humanity towards hell with an agenda to keep the Islamic World, particularly Pakistan, into pressure so as to boost the Zionist interests, to increase sale of colonial arms and keep their armament factories flourishing. He said Modi came to power under the agenda of Muslim enmity and started challenging the sovereignty of Pakistan. He is criticizing Pakistan on every forum and admits by kicking his chest that India was behind the breakage of Pakistan. He said, Modi is hurling open threats to Pakistan even today and threatening to stop every drop of water from India and considering his enmity with Pakistan a reward for him. He said in the presence of Modi the face of Hindu extremist state has been openly unveiled and he is promoting Pakistan-India enmity to gain success in the forthcoming elections in India. The Quaid-i-Millat Jafariya Agha Syed Hamid Ali Shah Moosavi said that key to rooting out all problems faced by Muslim lay in unity and brotherhood. He said the Islamic World will have to unite so that not only the Islamic World but the whole humanity can remain safe from any fear and harassment and the satanic tactics are defeated forever.